With 25 Olympic medals in its illustrious history, Canada is a perennial global powerhouse in figure skating. The 2018 Canadian Olympic Figure Skating team might be among the greatest the country has ever seen. 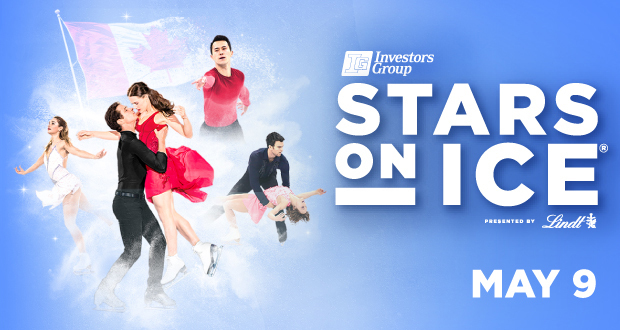 The 2018 Investors Group Stars on Ice presented by Lindt tour will feature many of those same skaters who will be vying for gold for Canada in the 2018 Winter Olympic Games. Poised to deliver the same level of excitement and excellence as the Games themselves, Canada’s premier figure skating tour will visit Winnipeg on Wednesday, May 9 for a 7:00 PM performance at the Bell MTS Place. The chance to experience the Canadian Olympic team live, delivering the same caliber of performance as witnessed in PyeongChang, South Korea, will be a special opportunity for figure skating fans. The 2018 tour cast is populated with no less than eight 2018 Olympic medalists, including; two-time Olympic Gold Medalists, three-time World Champions and eight-time National Ice Dance Champions Tessa Virtue & Scott Moir; 2018 Olympic Gold and Bronze Medalist, 2017 World Silver Medalist and three-time National Champion Kaetlyn Osmond; 2018 Olympic Gold and Bronze Medalists, two-time World Champions, and seven-time National Pair Champions Meagan Duhamel & Eric Radford; 2018 Olympic Bronze Medalist, two-time World champion and six-time consecutive European champion Javier Fernández; 2018 Olympic Gold Medalist, three-time World Champion, and ten-time National Champion Patrick Chan; and 2018 Olympic Gold Medalist, 2017 World Bronze Medalist, and two-time National Champion Gabrielle Daleman.